If you came here from Part 2 – Getting There, you’re up to speed on how this story has evolved. If not, I suggest you start at Part 1 – Background. When we left our heroes, they had arrived at the Isle of Man, having overcome significant personal injury and shipping obstacles. 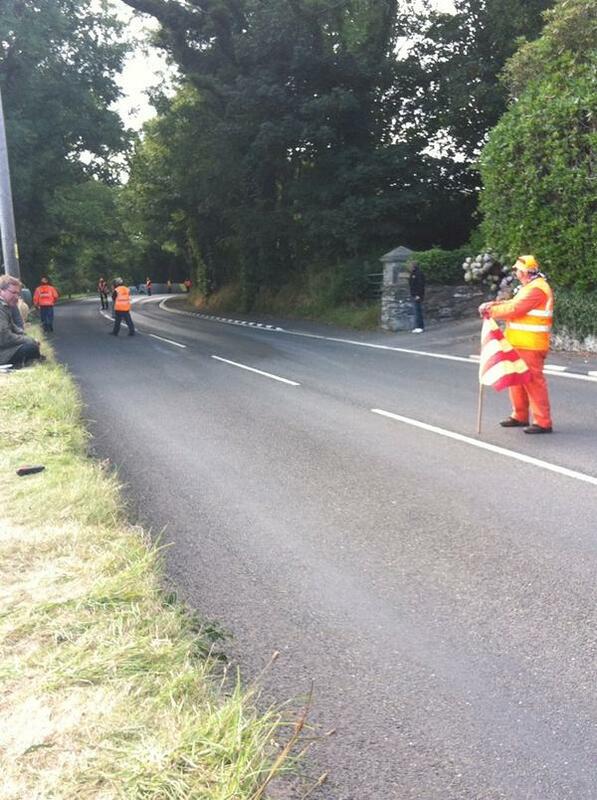 After a full day of thrashing, they were finally ready to put the bike on the one and only Isle of Man Mountain Course. On Wednesday, August 20, I finally got great news: after a thrash on Tuesday and Wednesday to get everything installed, they passed tech inspection and Wade took the bike out on course for the practice session at 7:05pm. Lap time 25:47.279, ave speed 87.785. The bike needs a few minor tweaks, but is otherwise running fine. Other teams have rallied to their cause and are sending mechanics to help, and the organizers really want him to run so they’re being lenient with some of the qualification requirements. Wade’s foot is holding up (as long as he doesn’t walk too far) and Rich reports that he (Wade) is grinning from ear to ear. Thomas (our new German friend) took this photo at 6:24pm – they look confident and ready to go, even before the initial success! On a much more grim note, Rich texted that a rider who was staying next door to their B&B digs at Roundhay crashed in practice and was killed. 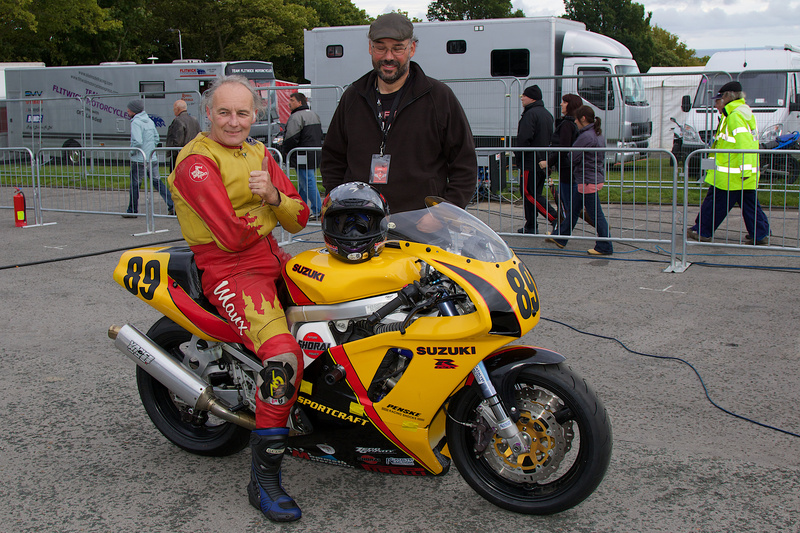 http://www.iomtoday.co.im/news/isle-of-man-news/competitor-dies-in-mgp-practices-1-6795237. This is the reality of the Isle of Man, and substantiates its reputation as the most dangerous motorcycle race in the world. Practice on Thursday, August 21, cancelled due to rain. This is another huge setback, because in order to qualify for the race, riders must have 5 laps on the bike and at least one lap time under 23:00. The rain day wasn’t a complete waste, though. When Rich and Wade arrived, with both of them in rather tenuous states of physical disrepair, they made the wise decision to rent a car to get them around the island. As it turned out, this was as much a strategic decision as practical. Every day, when the roads were open to the public, they drove around the course at least once, sometimes twice. 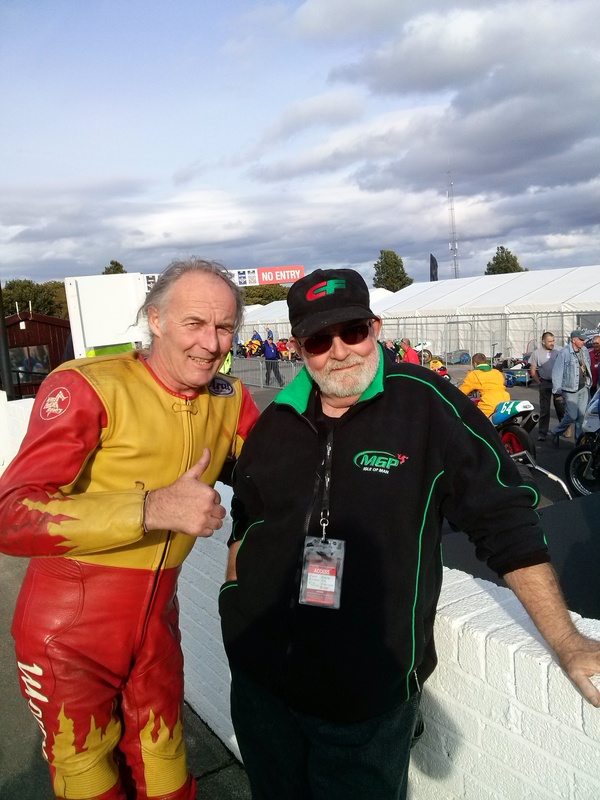 These “laps” gave Rich an invaluable opportunity to learn the course through Wade’s eyes, which enabled him to visualize the feedback Wade gave him after each practice session on the bike and then make educated adjustments to the suspension. The fellow standing next to Wade is Thomas, the benevolent German I mentioned in Part 2, who helped so much during the entire stay (including pushing the bike around so that our injured heroes didn’t have to). This photo was posted on Twitter: “Marshalls to stand on whiteline and direct riders over to clean side of road.” I can’t be certain, but I’m guessing that was our line of goo.